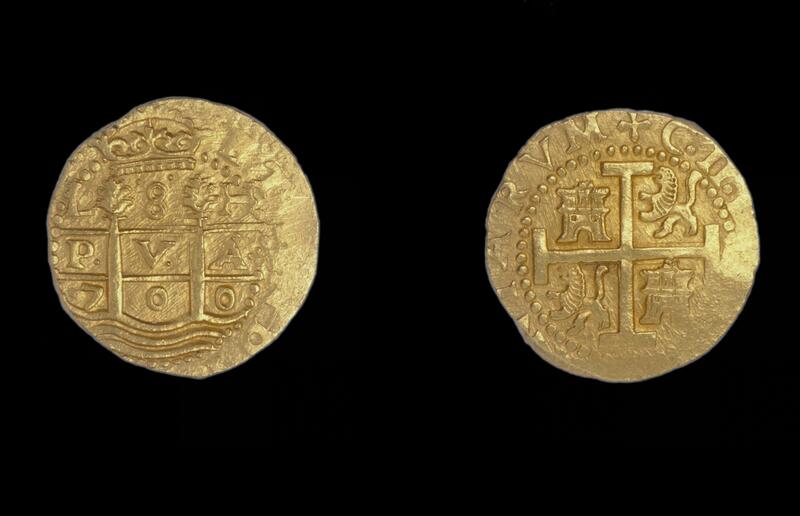 Gold coins (escudos) like this one were worth considerably more than their silver counterparts (called reales), and were much rarer. Two sides of a single coin are shown in this photograph, with obverse at left and reverse at right. This coin is called a “pillars and waves” type after its imagery: the Pillars of Hercules, associated with the straights of Gibraltar, the southernmost outpost of the Iberian kingdom, appear on the obverse. To the left of the top of the left-hand column, the coin is stamped with an "L" to show it was made in the Lima mint. To the right of the right-hand column is an “H,” the mark of an assayer whose name is not known, but who worked in the Lima mint from the late 17th to the early 18th century. The assayer, who oversaw the purity of coinage, always marked the coin with his initial. Late coins are dated (this one leaves off the first digit of 1700 that runs between the pillars), but many 16th century series were not. The reverse of the coin displays the symbols of Leon and Castile, the lion and castle. The irregular edge is typical of “cob” coins, such as this one, which were hand struck on dies. Like global empires of the present day, Spain distinguished itself by the solidity of its currency. The imagery on Spanish coins, imperial portraits and shields, had its roots in Roman coinage, and similar imagery is still used on coins of Spain and other nations today. 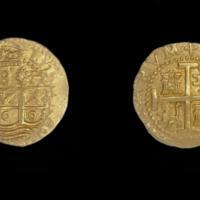 The Coins of Colonial and Early America. Bischoff, William L. ed. 1989. The Coinage of El Perú. Proceedings of the Coinage of the Americas Conference, no. 5 (held October 29-30, 1988). New York: American Numismatic Society. Jordan, Louis. "The Coins of Colonial and Early America.” A Project of the Robert H. Gore, Jr. Numismatic Endowment. University of Notre Dame, Department of Special Collections.